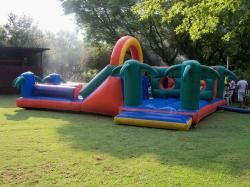 Endless Fun Party Venue and Boot Camp for Kids located in Equestria, Pretoria East. Endless Fun comprises a Party Venue as well as a Boot Camp for kids aged 6-12 years. We are located in Pretoria East on a picturesque smallholding in Willow Glen in the vicinity of Equestria, Wapadrand, Silver Lakes, The Willows, Murrayfield, Faerie Glen and Silverton. The Party Venue and Boot Camp are both for exclusive hire of party groups for periods of three hours per slot. Both venues have lapas with spacious preparation areas and ablution facilities and come with braai facilities and tables and chairs for your guests. The Endless Fun Party venue is especially suitable for parents with smaller children who can play safely in the well-equipped spacious playground under the watchful eyes of parents enjoying the relaxing atmosphere of the venue with its plentious tree cover. The Endless Fun Boot Camp is a separate venue for children 6-12 years old and here children form teams which compete against each over a series of fun obstacles and trials under the supervision of instructors while parents and guests encourage them or/and relax in a party atmosphere on the spacious grounds. See our Products and Services pages for details about these exciting products and their pricing. See our Photo Gallery for slide shows on the Endless Fun Party Venue and Endless Fun Boot Camp.